Noor Inayat Khan was born in the Soviet Union on 1st January 1914. Noor was the great-great-great-granddaughter of Tipu Sultan, the eighteenth-century Muslim ruler who died in the struggle against the British. Shortly after her birth in Moscow the family moved to England and later settled in France. After studying music and medicine Noor became a writer. Her children stories were published in Figaro and a collection of traditional Indian stories, Twenty Jataka Tales, appeared in 1939. On the outbreak of the Second World War she trained as a nurse with the Red Cross. In May 1940 France was invaded by the German Army. Just before the French government surrendered she escaped to England with her mother and sister. In England she joined the Women's Auxiliary Air Force (WAAF) and trained as a wireless operator. While working at a Royal Air Force bomber station, her ability to speak French fluently brought her to the attention of the Special Operations Executive (SOE). After being interviewed at the War Office she agreed to become a British special agent. Given the codename "Madeleine" she was flown to Le Mans with Diana Rowden and Cecily Lefort on 16th June 1943. She travelled to Paris where she joined the Prosper Network led by Francis Suttill. Soon after arriving a large number of members of the resistance group associated with Prosper were arrested by the Gestapo. Fearing that the group had been infiltrated by a German spy, she was instructed to return home. However, she declined, arguing that she was the only wireless operator left in the group. Noor continued to keep the Special Operations Executive in London informed by wireless what was going on in France. She also made attempts to rebuild the Prosper Network. However, it appears that the Gestapo already knew of her existence and were following her in an attempt to capture other members of the French Resistance. After three and a half months in France Noor was arrested in October and taken to Gestapo Headquarters. She was interrogated and although she remained silent they discovered a book in her possession where she had recorded the messages she had been sending and receiving. The Gestapo were able to break her code and were able to send false information to the SOE in London and enabled them to capture three more secret agents landed in France. Noor was taken to Nazi Germany where she was imprisoned at Karlsruhe. In the summer of 1944, Noor, and three other SOE agents, Yolande Beekman, Eliane Plewman and Madeleine Damerment, were moved to Dachau Concentration Camp. The four women were murdered by the Schutz Staffeinel (SS) on 12th September, 1944. In 1949 Noor Inayat Khan was posthumously awarded the George Cross. (1) Captain Selwyn Jepson first met Noor Inayat Khan when she first joined the Special Operations Executive. He later talked about this to the Jean Overton Fuller for her book Madeleine published in 1952. I see her very clearly as she was that first afternoon, sitting in front of me in that dingy little room, in a hard kitchen chair at the other side of a bare wooden table. Indeed, of them all - and they were many - who did not return, I find myself constantly remembering her with a curious and very personal vividness which outshines the rest. The small, still features, the dark, quiet eyes, the soft voice and the fine spirit glowing in her. The girl, on her own now, moved about Paris looking for old school friends. She found her former music teacher, Henriette Renie, for instance. One contact led to another. She stayed briefly in different parts of the city, trying not to compromise those who showed hospitality. She had a bicycle and carried the transmitter with her. Despite Buckmaster's warnings, she began regular transmissions from the first week of July and she continued until October, when she was caught and taken to Gestapo headquarters. (4) Citation published when Noor Inayat Khan was posthumously awarded the George Cross on 5th April 1949. 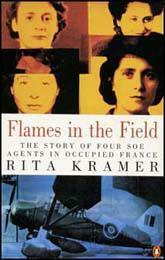 Following her arrival the Gestapo made mass arrests in the Paris Resistance groups to which she had been detailed. She refused to abandon what had become the principal and most dangerous post in France, although given the opportunity to return to England. She did not wish to leave her French comrades without communications and she hoped also to rebuild her group. The Gestapo had a full description of her but knew only her code name Madeleine. They deployed considerable forces in their effort to catch her and so break the last remaining link with London. After three and a half months she was betrayed to the Gestapo and taken to their HQ in the Avenue Foch. The Gestapo had found her codes and messages and were in a position to work back to London. They asked her to cooperate, but she refused and gave them no information of any kind.